posted by Lisa Ace in Sponsored Post, advertisement, Reliant Real Estate, batavia, Pavilion, real estate, Homes for Sale. 6800 Junction Road, Pavilion. Super solid move in ready raised ranch home on quiet 1/2 acre country lot! Move in and enjoy no honey do lists on this 3 bedroom, 2 full bath home. Downstairs features large family room with gas fireplace pretty ceramic floors, brand new full bath -- perfect hang out room or an awesome large master bedroom suite! Upstairs features hardwood floors large open kitchen/dining/living space ideal for entertaining! Three bedrooms with full closets and another brand new bath -- not a lot to do here but decorate! Outside is nicely landscaped and lot backs up to fields with pretty views--very easy to see! Call Lynn Bezon at Reliant Real Estate today or click here for more information on this listing. 8009 Bank Street Road, Batavia. Owner says SELL this solid 5 bedroom, 3 full bath home in move in condition! You can't find to many like this! This well laid out spacious home has something for everybody -- a newly redone and pretty kitchen with granite countertops, large dining area for friends & family, 5 good-sized bedrooms, well spaced out to give everyone privacy and 3 FULL baths-you can never have enough seats! When you walk in you are welcomed into awesome foyer/sitting room with beautiful wet bar and fireplace with vaulted ceiling leading to 2 loft style bedrooms-perfect for guests or his and her offices! All mechanical updates are in good working order and all appliances included! Located in the town with 1.5 acres and minutes from thruway for easy commutes to everywhere! Call Lynn Bezon at Reliant Real Estate today or click here for more information on this listing. posted by Lisa Ace in Sponsored Post, advertisement, Reliant Real Estate, Homes for Sale, New Listing, real estate, Lynn Bezon. Looking for space? Then look no further! Check out this solid 5 bedroom, 3 full bath home in move in condition! Last but definitely not least, LOCATION -- located in the town with 1.5 acres and minutes from Thruway for easy commutes to everywhere! Call Lyn Bezon today to see this listing or click here for more information. 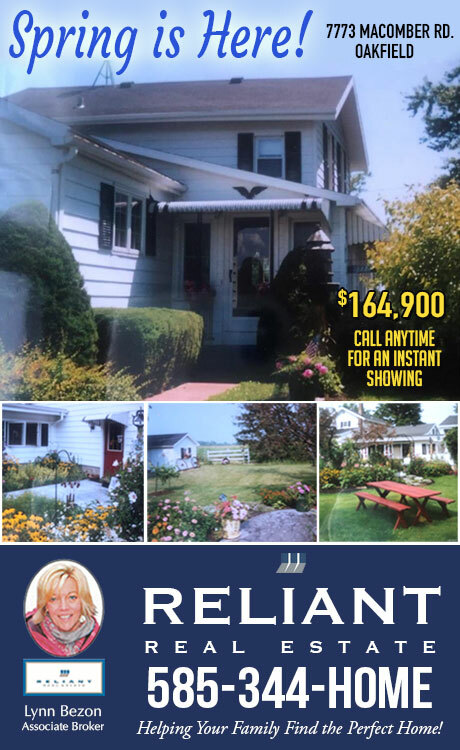 posted by Lisa Ace in Sponsored Post, advertisement, Reliant Real Estate, batavia, byron, Homes for Sale. Please click here to view the full listing for 1 North Park, Batavia. posted by Lisa Ace in Sponsored Post, advertisement, Reliant Real Estate, Lynn Bezon, Laurie Jennings, Premium Mortgage, batavia, real estate, Homes for Sale. Superbly maintained 3 bedroom bath and a half home with not one ounce of anything to do! This home is no flip...completely gutted and remodeled within the last 5 years, beautifully done and tastefully decorated. Roof full tear off 4 years ago and furnace 5 years ago. Beautiful cherry cabinetry with granite countertops, all stainless appliances to stay, plus washer/dryer! Nice formal dining with extra large living room area with cozy gas fireplace-great for entertaining. Upstairs bath fully gutted with super convenient upstairs laundry area and three large bedrooms. All new carpeting throughout as well! Outside features extra wide drive and double lot and nice back deck...Inexpensive utilities and no flood insurance, what more do you want? Check it out today. Call Lynn Bezon at Reliant Real Estate 585-344-HOME or click here for more information on this listing. posted by Lisa Ace in Sponsored Post, advertisement, Reliant Real Estate, Lynn Bezon, Homes for Sale, real estate. posted by Lisa Ace in Sponsored Post, advertisement, Reliant Real Estate, Oakfield, Lynn Bezon, Homes for Sale. Solid home in the heart of the Village! This three-bedroom home has a lot to offer, either to someone starting out or a growing family. This home is super spacious with a very open floor plan downstairs and upstairs featuring plenty of closets and good size bedrooms. The kitchen is sunny and bright and has homey back breakfast nook looking out to the fenced in back yard. There is an extra deep garage, plenty big enough for a car and work space! The basement of the home, with a little work, could be great extra living space -- it's already partially finished and has a wet bar! Offering central air and a new 200-amp electrical service. The roof on home and garage are 7 years young. With very little elbow grease this home can be up and running quick! Very easy to see! Call Lynn Bezon at Reliant Real Estate today or click here for more information on this listing. posted by Lisa Ace in open house, real estate, Homes for Sale, WNY Open Houses, genesee county..
posted by Lisa Ace in open house, real estate, Homes for Sale, WNY Open Houses, genesee county.